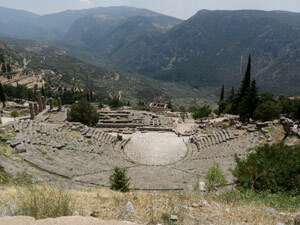 The highlights of this cruise are crossing the Corinthian Canal and stopping at Galaxidi which is the ideal place for a visit to the ancient site of Delphi on the mainland. 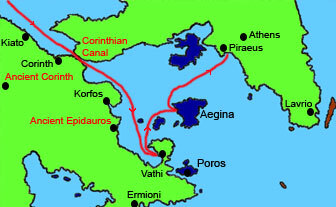 There will be two longish sails, the first from Ithaca to Trizonia and the second from Galaxidi to Vathi in the Saronic. Once all our guests have arrived onboard, we will set sail for the olive covered island of Meganisi which is 10 miles away. On Monday we will leave Meganisi in the morning and sail to nearby Skorpios, the private island of Aristotle Onassis with its amazing turquoise waters. After lunch and while we are approaching beautiful Ithaca under sail, you may wonder what Odysseus was feeling a few thousand years ago, as he was returning to his island! We will arrive there in the early evening having covered 15 miles that day. This is the one of the two longer days of this cruise, making an early start in the morning. We will sail from the Ionian through the Gulf of Patra and we will end our day in the evening at the tiny island of Trizonia, which is in the Gulf of Corinth. The total distance covered this day will be around 65 miles and we will sail under the longest suspended bridge in Europe, which connects the Greek mainland with the Peloponnese!! After we leave Trizonia we will stop in a bay for a few hours for our swim and lunch, before we set sail again along the north coast of the Gulf of Corinth for the small picturesque village of Galaxidi. The views along the route are magnificent, as we are surrounded by high mountains and the distance covered this day will be around 20 miles. In the morning we will spend a few hours in Galaxidi, so those interested to visit the famous site of ancient Delphi can take the local transport (it's only 60 km away) and spend some time sightseeing. The rest can enjoy a quite morning in this picturesque village and once everyone is back, we will set sail for the Corinthian Canal, which is 35 miles away. At the entrance to the canal we may have to wait a little bit until we are instructed to go through, and the crossing will take us about one hour. The canal is the gateway to the Aegean and once we are out at the other side, we will head for the tiny village of Vathi on the Methana Peninsula, where we will arrive after sunset. The village is actually situated on the side of a volcano which is not active any more, however it is still dormant. The total distance covered this day will be around 75 miles. After leaving Vathi in the morning we will stop at one of the numerous bays in the area, where we will spend a few hours, before taking the sails up and heading for the island of Aegina. 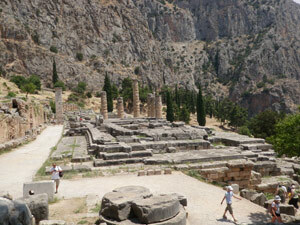 It is famous for its pistachios and the best preserved ancient temple (the Temple of Afaia). The distance covered this day will be 17 miles. On the last leg of our cruise we will stop at the uninhabited islands of 'Lagouses' for a swim and lunch, before we set sail again for Piraeus (the port of Athens), which is our final destination. It is not cost effective to buy a one way flight from your country to Preveza airport (the one serving Lefkas) and another one from Athens back to your country. It's better to get a return flight to Athens because at the beginning of your cruise you can easily get from Athens to Lefkas by bus (the journey is just over 5 hours). At the beginning of your cruise, you can get from Athens central bus station to Lefkas by national bus, the journey is just over 5 hours and the fare is around 34 Euro. From Athens airport you can get to the central bus station in Athens by express bus (departs every 20 minutes, journey duration is 40-60 minutes, the fare is around 5 euro). Similarly, from your hotel in the city center you can get to the central bus station by taxi for an average of 15-20 euros. Transfers at the beginning of your cruise from Preveza airport or Lefkas bus station to the yacht in Lefkas harbor, are easily done using the local transfer service or a taxi. For the transfers at the end of your cruise between the yacht and Athens airport you can use the public transport system (bus/metro or taxi).